In this solo cooking adventure, Kate whips up a simple, yet tasty meal for herself and BF. I am a bit of a follower, and have noticed that everyone has been talking about Fava Beans lately. And since I missed the chance to cook with ramps this spring, I couldn’t let the next overhyped seasonal ingredient pass me by! Nevermind that I have never actually had fava beans (that I can recall anyway). They are pretty and green and seasonal and time consuming (all that work coaxing them out of their outer and inner pods), and therefore the perfect little project for a Saturday night dinner at home. BF and I picked up the beans at the Grand Army Plaza farmers market in the morning. He grabbed a bunch of asparagus and asked me to make that too. I agreed, knowing that even though it’s not my favorite, I would simply roast it to rich deliciousness as I do most veggies. He was buying fruit for snacking and I was holding up to my nose and inhaling the heavenly aroma of basil that I had no intention of buying, when he came up behind me and suggested that we also make “That tomato, mozzarella and basil salad!” I rolled my eyes at him. What does he know about food anyway? First of all, it’s called caprese, and second . . . wait . . . I realized that for the first time in months, tomatoes are flavorful and bright and juicy again. That it has been ages since I’ve cooked with my favorite herb although I keep picking it up to smell it everytime I see it, and also that we had nothing to do all day but make dinner and take a nap, so why not visit Russo Mozzarella and Pasta (the Italian specialty store in Park Slope) for fresh buffalo mozarella? It was actually, I realized, a great idea. 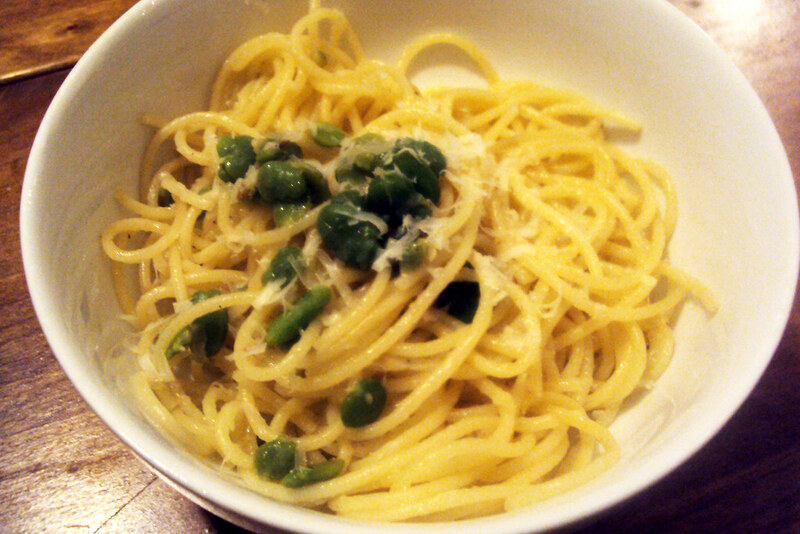 As dinner came together, I figured would follow a recipe I saw on Serious Eats for the fava bean pasta and therefore not write about it here (why blog about a recipe that I found on someone else’s blog?). Plus it’s just a caprese salad, anyone can do that, right? But then the fava beans looked so pretty cooking in the oil and garlic on the stove that I snapped a picture. And I ended up modifying the recipe enough to call it (sort of) my own, and the results were wonderful. It turns out that fava beans are a beautiful vehicle for garlic, cheese and pasta, both in flavor and texture. 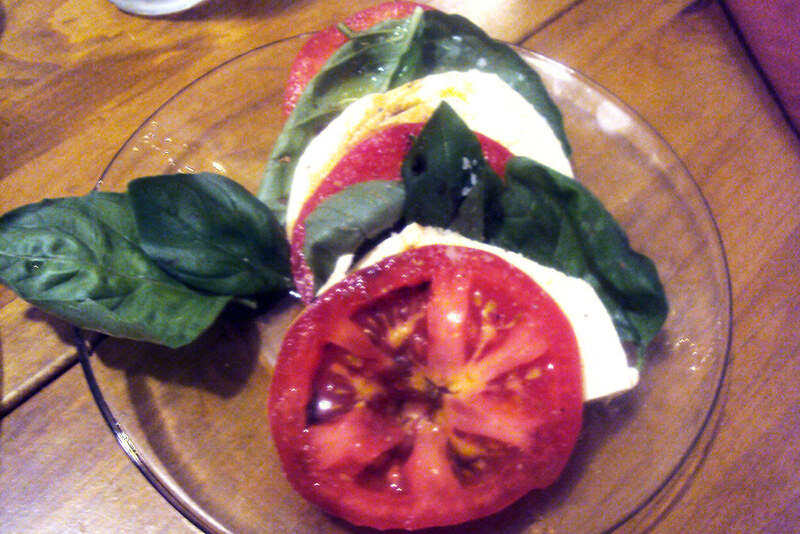 The caprese salad (although it involves zero cooking) that I put together was the best BF had ever had, and he had never made it himself. So why not write it down for people like him, new to cooking? And since the asparagus was roasted to nutty, charred, mushy-on-the-inside perfection, I figured I’d throw up a few pics here on Foodie Call, in case others want to make an easy dinner where the ingredients shine, while the cook steps out of the way. Time: 1 hour (counting the time it takes to remove the beans from their outer shells and inner casings, which can actually be a very zen activity if you have someone to chat with and a cold beer to drink). Remove the fava beans from their outer pods and blanch in boiling water for 2-3 minutes. Remove with a slotted spoon and place in a bowl of ice water. After the beans have cooled (a couple of minutes), drain water and remove the beans from their inner casings, revealing the bright green pod within. In a large skillet, saute the garlic in the oil over medium heat for 2-3 minutes making sure it does not burn. Add fava beans, red pepper flakes, a splash of the fava bean cooking water, and a pinch of salt. Cook for 6-8 minutes, stirring occasionally. Meanwhile, bring a pot of salted water to boil and cook pasta until al-dente. Drain pasta, reserving some of the cooking liquid. Add the pasta to the fava beans and toss to coat. If the mixture seems dry, add a bit of the pasta water. Turn the heat off and add all of the pecorino romano and half of the Parmesan. Taste and season with another pinch of salt and a few grinds of pepper. Plate the pasta and garnish with the remaining Parmigiano Reggiano. This dish screams Italian to me because all you have to get is procure the best ingredients, and then get out of the way and let them shine. Cut the tomatoes and cheese into thick slices and tear the basil leaves off the stems, keeping the leaves whole. Arrange ingredients in layers or in whatever pattern suits you. Drizzle a small amount of good quality olive oil over the plate and follow with an even smaller drizzle of good quality balsamic vinegar. Lightly salt and pepper and serve. 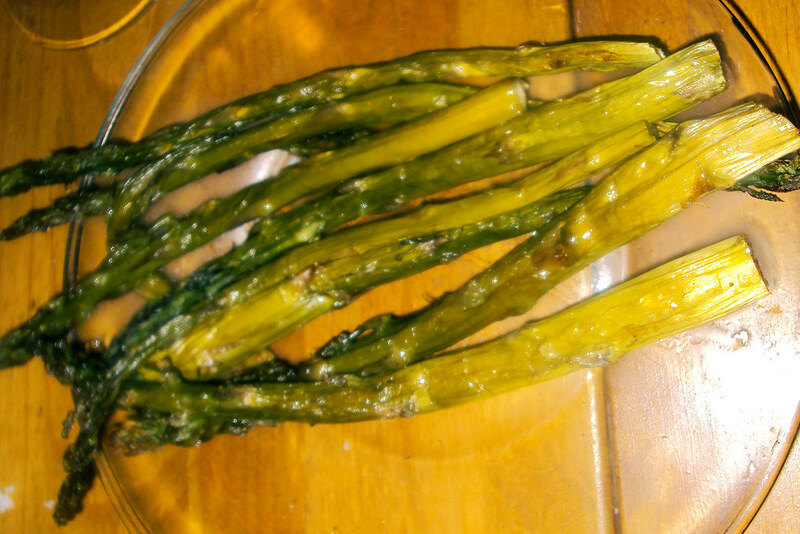 Rinse, dry, and cut the ends off the asparagus. Toss with about a tablespoon of olive oil and a bit of salt and arrange on a baking sheet (lined with parchment paper for easier cleanup). Cook for 15 minutes. After 15 check to see how done they are. Either remove from oven or flip the vegetables and cook for another 5-15 minutes, depending on how thick the stems are and how well done you like your roasted veggies.